The District 5 Holstein Breeders, in coordination with the Wisconsin Holstein Association, hosted the annual Adult Holstein Convention at the Wintergreen Resort and Conference Center in the Wisconsin Dells. Nearly 300 Holstein breeders from across the state were in attendance for meetings and to receive recognition for outstanding accomplishments in 2017. The convention kicked off Friday afternoon with a National Wisconsin Delegate Meeting and a Holstein USA town hall forum. Boyd Schaufelberger, Holstein Association USA President and John Meyer, CEO of Holstein Association USA, kicked off the forum with updates from national. Following, attendees were able to ask questions of those from the national association. Attendees headed to committee meetings following the forum. At the Friday evening meal, the 2017 Wisconsin Top Performer cows were announced. Recognized were cows owned by Selz-Pralle Dairy, Humbrid and Tom Kestell of Waldo. Receiving the overall Top Performer was Pam Selz-Pralle and Scott Pralle's five-year-old cow, Selz-Pralle Aftershock 3918 VG-88, with a record of 64,930 pounds milk, 3918 pounds of fat and 1943 pounds of protein. Aftershock 3918 is also the nation's record holder for milk yield. Also recognized were owners of cows that have produced 300,000 pounds of lifetime milk. The ninth annual Wisconsin Convention Futures Sale kicked off after the meal and again was sponsored by Wisconsin Holstein's Young Adult Committee. The Futures sale averaged more than $6,000 on 18 choice and live lots and more than $2,200 on 13 embryo lots. High seller at $49,000 was Lot 5 Pine-Tree 5976 Achi 7691-ET, consigned by Pine-Tree Dairy, and purchased by Sexing Technologies. This September heifer is one of the highest net merit$ females to sell at public auction with +1057NM. This consigment also set a new Future Sale record for top-seller. Second high seller was Lot 2 from Siemers Holstein Farms, Newton at $6,100. Siemers Flgship Brooke 28130, comes from Goldwyn's maternal line and is +2814 GTPI and +4.4 DPR. She sold to Jason Faria of Dumas, TX. Rounding out the top three was Lot 4 at $5,900, Langs-Twin-Elm Dtr Aries-ET consigned by Floyd & Lloyd Baumann. This June 2017 Detour daughter is +935NM$, +2771 GTPI, +153 CFP, +8.1PL, +2.2 DPR, +2.01 UDC. 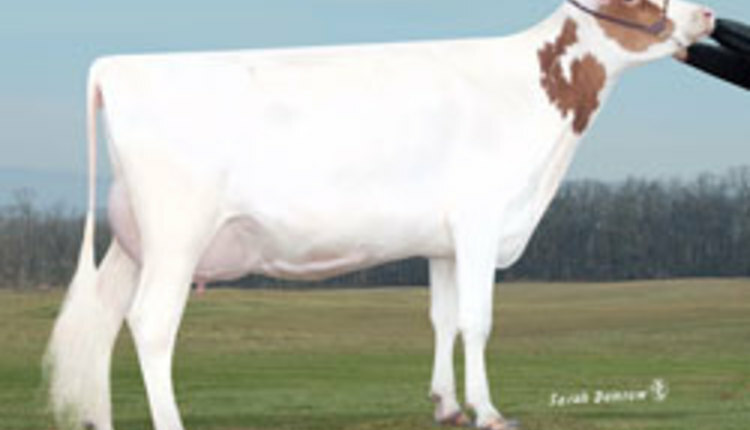 Her dam, View-Home Jo Amanda-ET has a +2890 GTPI son. Sexing Technologies was the buyer. This year there were numerous embryos lots with the high seller among these being Lot A, a package of four embryos from Our-Favorite Unlimited EX-93, two by Crush and two by King Doc, at $4,400. Lot consigned by Todd Stanek. Saturday morning included a panel discussion on robotic milking. Attendees heard from Randy Nigh, Viroqua and Larry Mayer, Chilton on their experiences as dairy farmers who are using robotic milking systems. The panel also included Kevin Coffeen, a banker and Wisconsin Holstein member regarding the financials behind robotic milking. The annual WHA business meeting was held and included committee reports from board members who head the various WHA committees and a report on the financial status of the Association. Two new board members were elected to serve a three-year term: Ryan Weigel, Platteville and Robert Cramer, Jr., Juda. Pam Selz-Pralle, Humbird, and Craig Carncross, Lodi, were re-elected to serve another three-year term. Retiring board members included Kevin Jorgensen, Waupun and Bill Calvert, Cuba City. Following the annual meeting, 40-year and 50-year members and Wall of Fame inductees were honored. This year's Wall of Fame inductees were Margaret Rasmussen, the cow Ripvalley NA Bell Tammy, bred by the Rippchen and the Ossmann families, and the bull Emerald-Acr-SA T Baxter, bred by the Ossmann Family and Scott Armbrust. Margaret Rasmussen was the first woman to be inducted in to the Wisconsin Holstein Association Wall of Fame. She and her husband, Norm, helped shape the association we have today. Margaret was the long-time editor of the Wisconsin Holstein News, a position she grew with as the publication grew to six times per year. During the 25 years Margaret and Norm were active in the association, county and state membership grew and the Wisconsin Junior Holstein Association was formed. Margaret retired from her role in 1983. Ripvalley NA Bell Tammy EX-94 GMD DOM was bred by the Rippchens and owned by the Ossmans. To date, Tammy as 1,500 maternal descendants in nine generations and is rated among Bell's best daughters. Tammy came around in the time protein was just starting to be tested and recognized. This cow was especially good at transmitting type and protein to her offspring. She had 30 daughters, 45 sons with 33 in AI in which eight of these bulls had careers in Japan. Bulls descending from Tammy's family include, Target (by Arlinda Carl), Tonic (by Cletius) and down the line Patrick and Baxter, our 2018 Wall of Farm Bull. Emerald-Acres-SA T Baxter EX-91 bred by the Ossmans and Scott Armbrust found his home at Alta Genetics. A Blitz from Emerald-Acr-SA T-Mallory VG-87 (Mtoto), Baxter was known to create all around good type cows with solid production. In May 2016, Baxter became a proven sire and the following year he was ranked the number nine TPI bull. Baxter had the genetics that breeders in Wisconsin, Canada and Europe wanted and that continue to impact the breed today. Following the awards luncheon, the afternoon was highlighted by farm tours to So-Fine Bovines, LLC, Westfield, and Walk-Era Farms, Wisconsin Dells. Honored at the Saturday evening banquet was this year's Distinguished Young Holstein Breeder, Marlowe Nelson Distinguished Service, and Distinguished Holstein Breeder award winners. This year's Distinguished Young Holstein Breeder award recognized Joe & Sarah Sarbacker, Fischerdale Holsteins, Belleville. Joe Sarbacker returned to the family farm after he graduated from UW-Madison in 2008 and now farms with his wife Sarah and three daughters. Sarbacker breeds for high type, production, components and DPR. He enjoys the challenge of breeding a cow that is profitable in the barn and that can compete in the show ring. This philosophy has garnered two All-American and nine Junior All-American nominations from three homebred cow families as well a sixth-generation excellent homebred cow. Sarbacker lays out a marketing plan each year to sell genetics. His goal is to improve production to 30,000 pounds of milk and 1,000 pounds of fat and protein as well as increase his BAA to 111. This year's Marlowe Nelson Distinguished Service award honored Dr. David Selner of the National Dairy Shrine. Selner is a long time Wisconsin Holstein supporter. Growing up on his family's registered Holstein dairy, Selner grew his love for the agriculture industry. He graduated from UW-Madison with a bachelor's, master's and Ph.D in dairy science and dairy nutrition but started his career in the field of genetics working for Midwest Breeders then Alta Genetics. He has played a large role in the startup of the Badger Dairy Club and was a founding member of the Intercollegiate Dairy Challenge. Currently, Selner is the executive director of the National Dairy Shrine. The 2018 Wisconsin Holstein Distinguished Breeder award recognized Don and Liz Mayer of Mayerlane Holsteins, Bloomer. The Mayers purchased their farm in 1990 with 20 cows and big dreams. Numerous remarkable cows have made Mayerlane home including: Mil-R-Mor Valiant Velma, Golden-Oaks Mark Prudance, Pinehurst Royal Rosa and the famous Whittier-Farms Lead Mae. All of which have had a significant impact on their herd and merchandising efforts. The Mayers blend high type, deep pedigreed cows with the best proven sires and are now tapping into genomic sires. Also honored at the Saturday evening banquet were outstanding advertisements in the Wisconsin Holstein News in 2016. Taking top ad honors for the year was Our-Favorite Holsteins. The WHA Board of Directors met at the conclusion of the convention to elect officers for the upcoming year. Craig Carncross of Lodi will serve as President. Vice President will be Heather Jauquet, of Pulaski and Secretary Erica Ullom of Bloomer, with Steve Endres, Waunakee and Bryan Stremcha, Bangor, also serving as Executive Committee members. The Wisconsin Holstein Association holds its annual convention each year in February. For more information on this or other events, check out the website at www.wisholsteins.com, or call 1-800-223-4269.